12V 3300 mA multi-stage recharger with universal AC input and removable AC cord. Includes an auto-sensing desulfating feature. These are state-of-the-art battery chargers that can be used on-demand, or left permanently on the battery for maintenance and sulfation prevention. It uses energy-saving techniques and and and advanced pulsed charging algorithm to allow better control of gas recycling and plate corrosion. This desulfating charger can rejuvenate batteries that have been left uncharged for extended periods of time, such as motorcycle, ATV, and tractor batteries. The charger is fully isolated from the mains, has universal AC input, and a removable AC cord. Although designed for sealed lead acid and gel batteries, these will also accurately charge flooded and automobile batteries. These chargers are also used as higher efficiency charger replacements and retrofits for 12 volt safety lights. 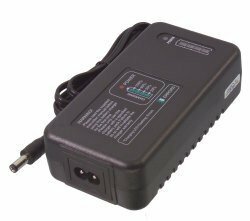 Type Battery Pack Charger for jump-starters, R/C, Robots, motorcycles, ATVs. Can be left on the battery without causing damage, also useful for battery maintainer applications. Stage 1 desulfation. A 200mA constant current source is applied to the battery. When the battery accepts the 200mA at a voltage less than 13.9 volts the charger moves to "bulk charge." This could happen within seconds if the battery is not sulfated. Stage 2 bulk charge stage. 3.5 amps is applied to the battery until the voltage rises to 14.4 volts. Stage 4 pulsing charge. The current is switched between 300mA and 3000 mA. If, during the 300mA part of the cycle the battery drops below 13.3 volts a new pulse is started. If the voltage stays above 13.3V for more than 30 minutes (verification stage) the charge is terminated. Stage 5. The voltage is measured and then the voltage falls below 12.7 volts the charger returns to stage 2. 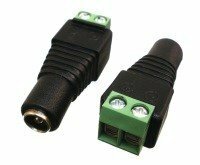 Input connector 2 prong IEC C7 removable cord, USA cord provided unless otherwise requested. The desulfation or rejuvenation algorithm works by detecting that the battery charge current is low even when the charge voltage is high. This can mimic a fully charged battery, so additional information is needed. This is done by increasing the voltage up to 18 volts with a small current limit. If the battery reaches that current limit without much additional voltage the charger signals that the battery is fully charged. If, however, the current limit isn't reached by 17 or 18 volts the charger signals that the battery is sulfated and automatically goes into the desulfation charge as is shown in the above diagram. When the desulfation is complete the charger switches into the bulk charge mode. We have found this very effective in rejuvenating sulfated batteries, but if the battery has lost a lot of water the battery will not have much capacity left. Can be left on the 12V battery to maintain the battery, for example over the winter.